Everyone claims that the festival they are going to is the best one out there. And while they may be great, nothing can match the incredible talent and insanely fun events that happen every year at Las Vegas’ premier festival. The Life is Beautiful festival is more than just about the hottest music, the most stunning art, the best mouth-watering food, and the latest mind blowing innovations. This festival is an intense celebration of life and all of the best ways to experience it. Using the vibrant city of Las Vegas as its backdrop just heightens the already amazing festival, and gives attendees the chance to count on the highlight of their year being every September during their visit to Las Vegas for the event. So what can you expect when you decide to go to the Life is Beautiful festival? While the experience will be totally different every year, there is a basic undercurrent of learning and art that carries over. This festival is a completely unique mix of events that will allow you to craft your own festival experience. Every day is packed with events that will challenge attendees to think more, live larger, and enjoy everything. Just what can you expect to encounter at this event? Keep reading to get a sense of the wide range of experiences you can have at this amazing event. This festival truly focuses on inspiring and connecting its attendees. You will leave knowing more, and thinking more deeply on important issues that impact all of us. Gaining a new perspective and finding a new sense of purpose can often be a lofty goal, especially while attending a festival. Life is Beautiful seamlessly melds the vibrancy of art and music with the though leaders and innovators that will help you shape new perspectives. These will not just be yawn-inducing presentations or inaccessible lectures. You will find yourself listening to candid personal stories from some of the most inspirational people in a wide range of fields. Some of the events are even interactive chats, allowing you to ask the questions that you want and get to the root of the issues you care about. Learning about the world around you and finding new paths can leave you hungry both mentally and physically. Luckily, the festival has you covered! Las Vegas is known to attract international tastes and draws on a wide range of ever-evolving cuisines to define itself. This global influence is not lost on the festival organizers for a second. It is clear they understand that while you may be happy to eat standard festival food, adding a unique culinary component to the event will completely change your experience. Everything from the food to the drinks are carefully planned to add to the event. Amazing local chefs are housed in what are known as “culinary villages,” where they delight hungry visitors with the absolute highest-quality foods. When you are dancing, thinking, and taking in all that the festival has to offer, it is awesome to know that you will be able to compliment your experience with a wide range of delicious foods. Want to dance off the delicious meal you just ate? Or maybe you would rather chill out and sip a cocktail while experience the best musical artists around? Life is Beautiful has a musical lineup that can’t be topped. Every year the lineup gets more and more incredible! 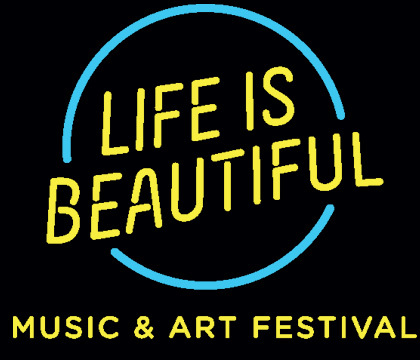 Life is Beautiful draws a wide range of artists, with everyone from City and Colour to Jimmy Eat World and Third Eye Blind flocking to their many music stages. You will absolutely find it difficult to choose which acts you want to see among the impressive lineup. Each day of the jam-packed festival offers music for every taste but also musicians you will be excited to hear. You will have bragging rights for years after watching the Shins play live at this festival. Enjoying music is enhanced by the environment that you experience it in. While the music itself might be wonderful, where you are listening and what you see around you can be incredibly influential in how you feel. This is why Life is Beautiful takes makes such a big effort to surround you in the beauty of art. One way this festival really sets itself apart is its truly inspiring focus on art. Having specially commissioned murals is just one way that you will be given an amazing artistic experience when you attend Life is Beautiful. The festival organizers take the art theme a step further to ensure that you will have a full immersive experience unlike any other. Using everything from Insomniac’s Art Cars to help transport you between music stages, to giving local artists a high-profile spotlight they might not have otherwise had, the festival takes art and makes it a part of life. The huge focus on art and artist shows a wonderful attention to detail, and even spaces like abandoned buildings are turned into bespoke works of art. Clearly, Life is Beautiful gets that your surroundings influence your attitude and experience. Their artistic touches will envelop you in a new and positive way to experience an already exciting festival. Life is Beautiful more than lives up to their name. The festival pays attention to every potential impact and influence and develop a completely unique way for their attendees to enjoy a festival. Instead of it being simply a fun time, the festival will create bonds, inspire innovation, and develop new connections that its attendees will carry with them for years to come. Attending Life is Beautiful is absolutely signing up for a once-in-a-lifetime chance to get a new perspective in an incredible environment. Whether you come primarily for the music, the food, the innovators, or the art, you will walk away having created new memories that will last a lifetime. Indulge your curiosity and exchange thoughts with your peers all while reveling in the best music and eating the most delicious foods. Whatever you choose to do at the Life is Beautiful festival, you will absolutely find yourself amazed by this immersive experience.